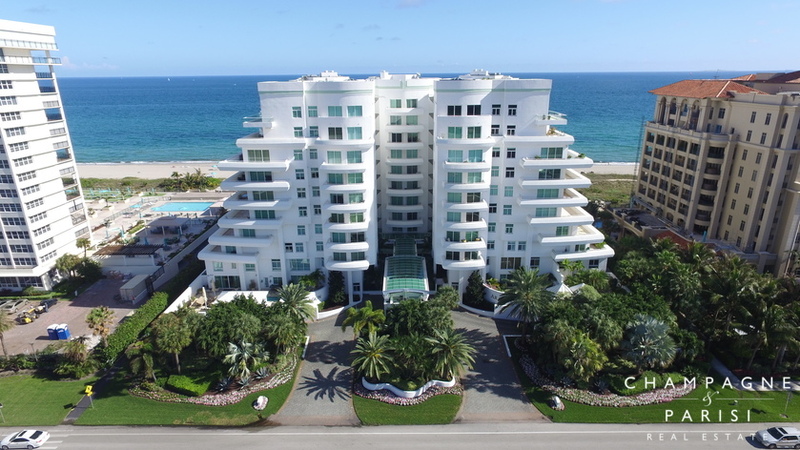 Aragon is one of the most prestigious, full-service oceanfront condominiums on the Southeast coast of Florida. Comprised of three, ten-story high-rise buildings with just 41 ultra-luxury condominiums, Aragon offers luxurious beachfront living in Boca Raton at its absolute finest. Condominiums for sale in Aragon offer up to six bedrooms with 4,000 to 7,700 square feet of elegantly appointed living space, with each unit custom-designed and unique. These ultra-luxury condominiums feature a host of exquisite features including chef-inspired gourmet kitchens with state-of-the-art appliances, granite, and marble countertops, and high-end custom cabinetry, private elevators, floor-to-ceiling hurricane impact windows, sparkling marble floors, and grand open living spaces perfect for entertaining. Aragon condos also boast expansive wrap around balconies offering magnificent, unobstructed views of the Atlantic Ocean and the Intracoastal Waterway. These impressive units offer residents the feel and privacy of living in a grand estate home combined with the stress-free and low-maintenance lifestyle of living in a full-service, concierge luxury condominium building. Aragon offers a variety of world-class amenities that residents may enjoy year-round including a beautiful, heated oceanfront pool, private beach access with towel, umbrella, and water service provided, spa, sauna, steam room, 2,500 square foot terrace with barbeque area and heated lap pool. There is also a beautifully-appointed party room, squash courts, and a state-of-the-art fitness center. This full-service boutique building also offers 24-hour security and staff with an on-site manager, as well as valet and concierge service. Aragon is also one of the few pet-friendly oceanfront buildings in Boca Raton, and also allows homeowners to lease with some basic restrictions. Residents are offered to purchase a private membership to the nearby Boca Raton Beach Club. Aragon is located directly on the oceanfront, South of Camino Real on A1A in the heart of the prestigious Boca Raton beachfront. This premier location offers residents the convenience of being just steps away from the beautiful Boca beaches. Many of the area's community parks are also nearby, including South Inlet Park, which offers fishing, swimming, playgrounds, walking paths, pavilions, and scenic picnic areas. Residents are just a short drive from all the excitement and action happening in downtown Boca Raton, as well as the fine shopping, dining, and entertainment venues at Mizner Park. Aragon is located within one of Boca Raton's top-rated school districts and is convenient to some of the area's major highways including Florida's Turnpike and I-95, making it simple to take a quick trip to one of the popular surrounding South Florida destinations such as Ft. Lauderdale, Miami, and West Palm Beach. If Aragon sounds like the place to live out the luxury lifestyle of your dreams, you may also want to visit similar oceanfront condos in Boca Raton, including Excelsior and Luxuria, both which offer ultra-luxury oceanfront condominium living. If you would like to learn more about Aragon, or any of the surrounding luxury beachfront condominiums in Boca Raton, please contact Champagne & Parisi Real Estate at 561-998-9015. You may also reach us by completing our simple online contact form below and one of our Boca Raton luxury real estate agents will reach out to assist you. We look forward to assisting you in finding your next dream luxury condo in beautiful Boca Raton, FL! Also, please consider registering for a free account which will enable you to receive automatic email notifications when new condos in Aragon come on the market in Boca Raton, FL.